Imagine receiving a luxury chocolate box like this. 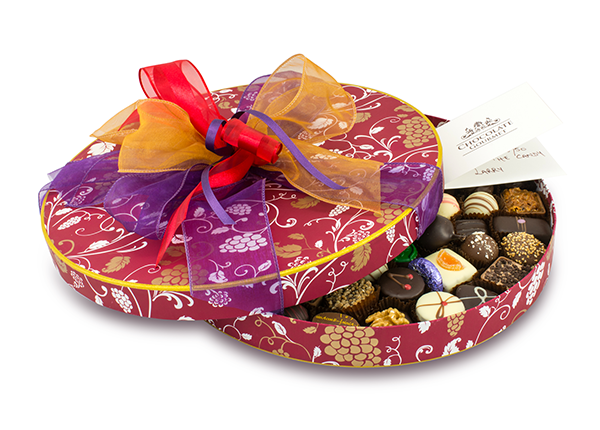 Our 1500g box makes the ideal chocolate present. Filled with delicious chocolate truffles from our range, hand filled and carefully wrapped. Our luxury chocolate box patterns are chosen by the owner Janette and are bespoke to Chocolate Gourmet. Contains up to 80 truffles, equally delicious and uniquely chosen. Make someone feel really special with this superb luxury chiffon and satin ribboned box. Indulge their chocolate desire, tempt their taste buds with some melt in the mouth truffles filled with cream, ganache, nougat, praline and alcohol, to name but a few.